ETA of cassettes from duplication.ca (Analogue Media Technologies Inc.) is April 4th. Release date is April 15th. You can pick them up in Lethbridge from Blueprint Entertainment or The Owl Acoustic Lounge. Or you could get a copy from the merch tables of your favorite Lethbridge bands. 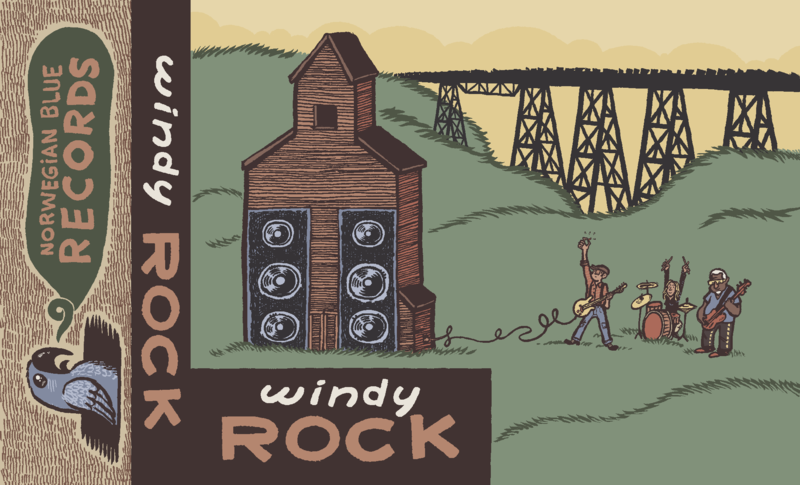 Windy Rock available for pre-order now! So excited to be able to share this with everyone. The Windy Rock pre-order is now live. Get the digital version for $4 or upgrade to the cassette version for just $2 more! Both versions will come with a digital download of the album, and anyone who pre-orders will get a download of the first track on Side A and the first track of Side B. What are they you ask? Side A, track one is Classette’s Diamond Blue. This is a brand-spanking new local band who, as far as I know, have not even played a show yet. I wasn’t even sure they had a band name until they sent me the track! Diamond Blue is a jangly meditation on love that will fishhook your heart. You’ve been warned. Side B, track one is by recently resurrected pop-heroes the darby and joan club. Little Boy is a ripper of a track, zipping along over saturated guitars, a Beatles backbeat, and a solo pushed to it’s breaking point. It’s a bit of a departure from their previous work, but it will feel instantly familiar to DJC fans. The album drops on April 15th. We will have copies available for sale online as well as at Blueprint Entertainment and The Owl Acoustic Lounge. Stay tuned for more updates! I have had this under my hat for quite some time now, but it was one of the first steps that I got underway. I spoke with our esteemed artist way back at the end of January about collaboration. When he responded with an affirmative I was beyond pleased. Lethbians will know him as the hat/glasses/beard guy from his slice-o-Lethy-life comic series Slaughterhouse Slough. Ladies and gents, Eric Dyck! I couldn’t be more pleased with what he dreamed up. Prairies, music and even the train bridge (sorry, viaduct.) Thanks so much Eric for putting your one of a kind stamp on our project. Click one of those links to hire him for yourself. Man’s gotta eat! We are getting closer everyday to our release dates. Pre-orders will open up this Friday! Protip: click on the picture for a bigger view. Get panoramic! The wait is nearly over! The tracks for the compilation are being Mastered this week, then it’s off to the duplicators. We are proud to present you with the track list for the Windy Rock compilation! Lustre Creame – Donde esta mi crema de brillo? More info coming soon. Cheers all.